Click on the image to download the compressed document in zip format. 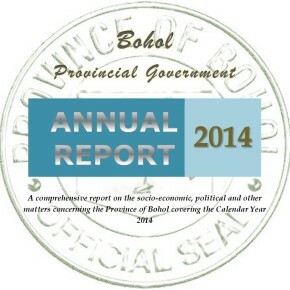 This Annual Report for Calendar Year 2014 comes on the heels of the State of the Province Address (SOPA), which I delivered on February 20, 2015, revolving around the theme of Boholano stakeholders “Coming Together, Keeping Together, Working Together,” as inspired by the words of the great Henry Ford. That occasion marked the first time that the SOPA had been delivered in a public venue, outside the hallowed halls of the Sangguniang Panlalawigan (SP). The SOPA, of course, summarized the most important accomplishments of our Provincial Government and its partners and stakeholders over CY 2014, and we were blessed by the attendance of the Honorable Speaker of the House of Representatives, Speaker Feliciano “Sonny” Belmonte (with Cong. Eleandro Madrona and Cong. Al Francis Bichara), Ambassador Carlos Chan, top-level local and national officials, and other VIPs. Most importantly, it was a great privilege to report those accomplishments to the Honorable members of the SP, and to the cross-sectional representation of Boholano stakeholders present during the day. This Annual Report presents the details of those accomplishments summarized in the SOPA. Needless to say, the SOPA highlighted the most significant accomplishments over the previous year, but there are many more, as even a cursory perusal of the pages of this Annual Report will show. All the agencies in the Provincial Government of Bohol, and even our partner national government agencies, have contributed their respective efforts to the accomplishment of our development agenda and framework, summarized in our HEAT-IT Bohol HELPS LIFE towards the BIG LEAP development call. All of these accomplishments have been due to our unity and harmony as one province, in collaboration and partnership with our external stakeholders. Time and again, there are situations that showcase just how unique Bohol is, in its unity among stakeholders, in its pervasive reception to the principle of shared leadership, and in its collaborative pursuit of one common vision. To God be the glory! I am a member of the Enactus Philippines(BISU Chapter). I and my co-researchers are presently conducting a research study for our first project- the Puso Coin Purse. In this connection, our research team would like to request a most recent data about the poverty rate of the towns of our province. We would appreciate if you include and specify the data of Cortes, Bohol-the hometown of the beneficiaries of our project. The only poverty data with barangay aggregation that the PPDO have is the Poverty Database Monitoring System (PDMS). Municipal level data can be found on the sub-sections under the Municipalities tab. A more recent poverty profiling survey is being conducted under the Community-Based Monitoring System (CBMS), but the data is not yet consolidated. You may have to contact each municipalities of your interest for such data. However, the official poverty data may be accessed through the National Statistical Coordination Board (NSCB), but I don’t think they have data up to the barangay level.